Lost Buildings of the Macaroni Railroad in Inez, Texas. On December 26, 2004 we still had remnants of a record snow fall in the area of Victoria. As I was passing through [the town of] Inez, I noticed these snow-laden cabins I've frequently admired over the years while traveling between Houston and our ranch place in Victoria. Though I've never really known what the cabins were until now, they were obviously very, very old and recently, I had noticed that the structure is faltering in the elements. It was difficult to believe this structure didn't have some historical value. I stopped that day to secure photos of the cabins in the snow, three small cabins in a row under the same roof, each with a chimney of its own. Having taken the photos, I then decided to see what I could find out about the structure. I researched the area web sites and obtained what information was available about the area and the town of Inez, but could find nothing about the object of my photos. I then called the Chamber of Commerce with no answer received and then the Volunteer Fire Department. I spoke with a very nice man who knew nothing of the history of the cabins, but knew of the structure I was talking about. He gave me the number of a Mrs. H. who owns property near the cabins. While Mrs. H didn't know who currently owns the structure or the property where it stands, she was still most helpful. She told me that the cabins were built and owned by the railroad company when the New York, Texas and Mexican Railway connected its line from Rosenburg to Victoria and built through Inez (which would place their date of construction between the years 1882 and 1900). She said that they were built to house the laborers of the railroad at "Inez Station." She added that the laborers lived in the tiny cabins with their wives and as many as two to three children at a time. 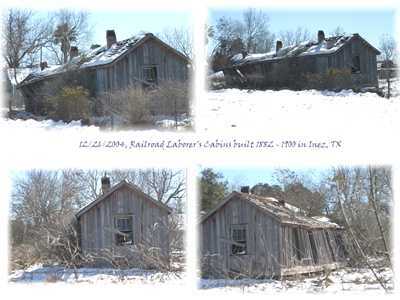 Just south of the cabins, a two-story building which was then the area "Railroad Section House" still stands. When the railroad's rails were taken up in the 1990's, the property was sold to an elderly couple who later died. The property was then resold to new owners who are unknown to my Mrs. H.
It seems such a shame that the little building is not being preserved for its historical value and interest and that there is no historical marker. I am interested in getting this information to someone who may wish to pursue this in order to preserve this quaint little piece of history. Anyone wishing to share information, stories or photos of Inez, Texas, please contact us.